Front view of my system on March 21, 2010, towards the end of the three years that I maintained it. This is the history of my 90-gallon reef aquarium with display refugium that I maintained for approximately 3 years from June 2008 to January 2011. The unique aspect of my system was the large display refugium visible from the front of the setup and located directly beneath the display tank. To accommodate this design, I had to have the stand custom built locally. I had initially hoped to fill the display with gorgonians and the refugium with exotic macro-algaes, but this later turned out to be much more difficult than I had anticipated. The system before any plumbing. I later had to cut away the wooden panel above the refugium. 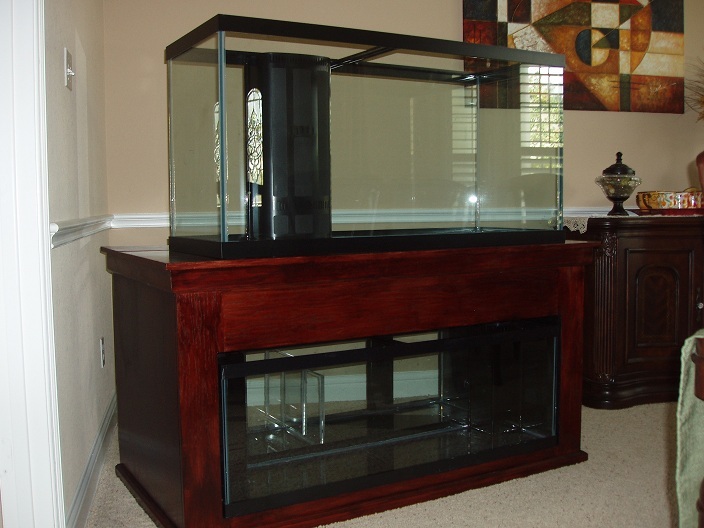 The display tank was a standard 90-gallon All-Glass-Aquarium with built-in overflow. 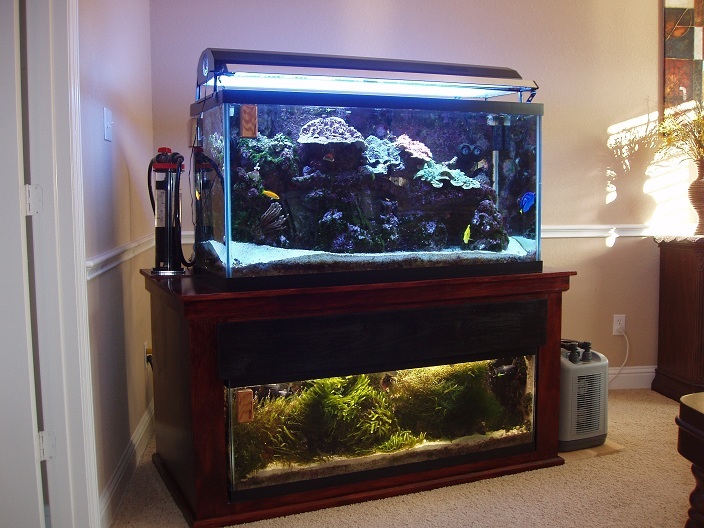 The display refugium and sump were both identical standard 42-gallon All-Glass-Aquariums. Both were placed below the display tank, one directly infront of the other. Both of these tanks had to be drilled locally. Additionally, the sump needed baffles installed and the display refugium needed an overflow added. These customizations actually made the bottom two tanks more expensive than the display. Water would overflow from the display tank directly into the refugium below, from the refugium to the sump behind it, and from the sump it was pumped back up into the display tank. I eventually increased water-flow enough that the refugium could not handle all of the water overflowing from the display tank and I had to split the line so that only half would go through the refugium. The total volume of the system, accounting for the reduced water level in the sump but not for the water displaced by live-rock and sand, was about 155 gallons.